Update 12/2/15: We’ve now followed up on this story: The more we learn about memory, the weirder it gets. The original continues below. MIT researchers have shown, for the first time ever, that memories are stored in specific brain cells. By triggering a small cluster of neurons, the researchers were able to force the subject to recall a specific memory. By removing these neurons, the subject would lose that memory. As you can imagine, the trick here is activating individual neurons, which are incredibly small and not really the kind of thing you can attach electrodes to. 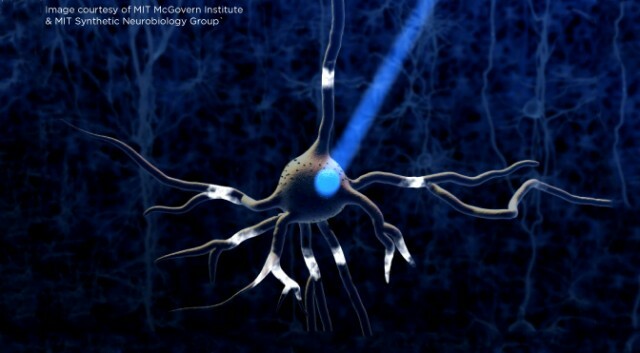 To do this, the researchers used optogenetics, a bleeding edge sphere of science that involves the genetic manipulation of cells so that they’re sensitive to light. These modified cells are then triggered using lasers; you drill a hole through the subject’s skull and point the laser at a small cluster of neurons. Now, just to temper your excitement, we should note that MIT’s subjects in this case aremice — but it’s very, very likely that the human brain functions in the same way. To perform this experiment, though, MIT had to breed genetically engineered mice with optogenetic neurons — and we’re a long, long way off breeding humans with optogenetic brains. In the experiment, MIT gave mice an electric shock to create a fear memory in the hippocampus region of the brain (pictured above) — and then later, using laser light, activated the neurons where the memory was stored. The mice “quickly entered a defensive, immobile crouch,” strongly suggesting the fear memory was being recalled. Bear in mind, too, that this research follows on from MIT’s discovery last year of Npas4, the gene that controls the formation of memories; without Npas4, you cannot remember anything. MIT has successfully bred mice without the Npas4 gene. The question now, though, is how memories are actually encoded — can we programmatically create new memories and thus learn entire subjects by inserting a laser into our brain? We know that a cluster of neurons firing can trigger the memory of your first kiss — but why? How can 100 (or 100,000) neurons, firing in a specific order, conjure up a beautifully detailed image of an elephant? We’ve already worked out how images are encoded by the optic nerve, so hopefully MIT isn’t too far away from finding out. Next Post: Energy converted from waves!